The 90th Annual Academy Awards took place yesterday and while it was less political than this year’s Golden Globes there were still plenty of talking points from Hollywood’s biggest night. With the event winding down, conversations around what happened on the day are just beginning so, we’ve summarised everything you need to know about the ceremony in order to look informed. In his second turn as Oscars host, Jimmy Kimmel’s lengthy opening speech touched on last year’s Best Picture mix-up (we’re still not over it) and ribbed Timothée Chalamet for his age (he was the youngest Best Actor nominee in almost 80 years at 22). However, it was his comments about Harvey Weinstein and Hollywood’s ongoing sexism scandal that really had Twitter talking. She’s been nominated four times, won once and made us laugh more times than we can count – and thankfully the 2018 Oscars was no different for Jennifer Lawrence. 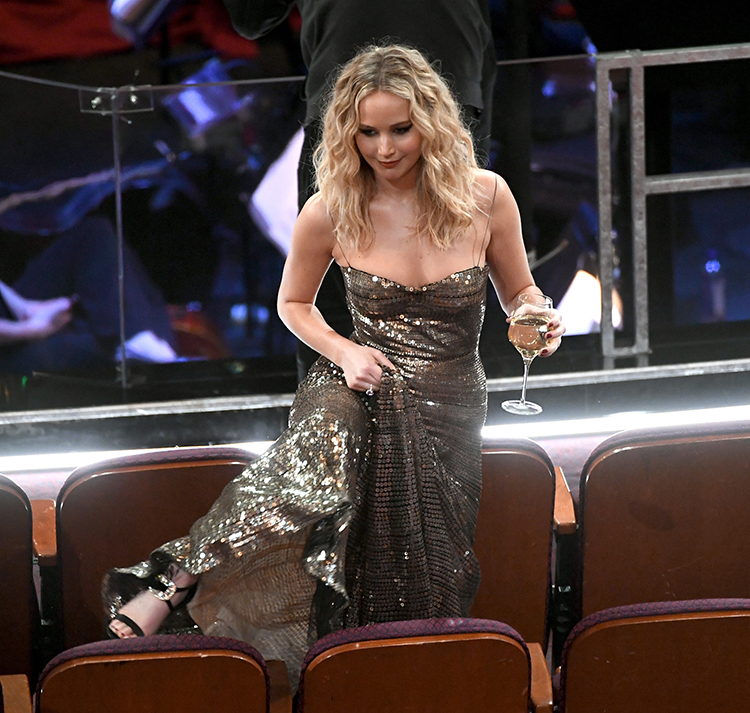 After discovering she’d missed her actual seat by one row J-Law hitched up her Dior gown and clambered over a row of seats all the while expertly balancing a glass of wine. A move that may have toppled the best of us, she remained calm, collected and in control all while wearing a designer gown and heels. Her wine-drinking, chair-climbing antics definitely made her a hero in our books. 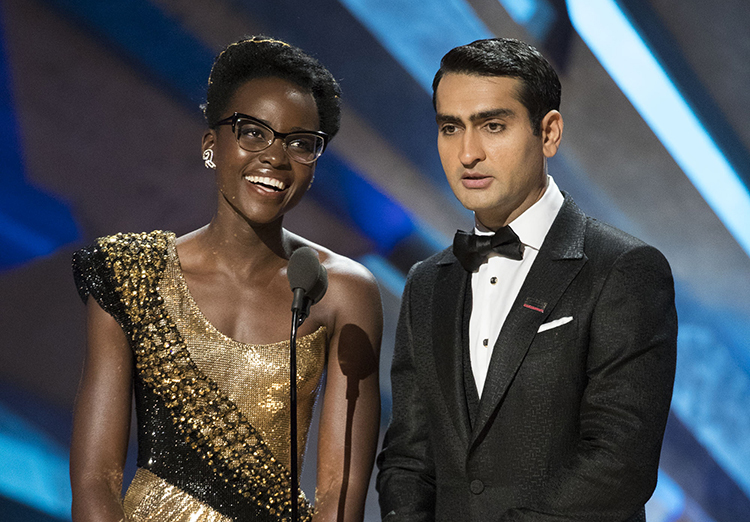 Presenting the award for Production Design, Lupita and Kumail introduced themselves as immigrants (from Kenya and Pakistan respectively) and made a poignant appeal for Dreamers: those who live in America under the Deferred Action for Childhood Arrivals policy, which Donald Trump ended in September 2017. “And so, to all the Dreamers out there, we stand with you,” added Kumail. Not only did the Girls Trip star ace her presenting slot with Maya Rudolph by removing her heels and calling our blisters, but she also met her hero Meryl Streep… and asked her to be her “mama”. The two Hollywood legends came together hand-in-hand to present the award for Best Actor. “Jane and I are very, very honoured to have been asked to present together, on Oscar’s 90th birthday,” began Dame Helen. “Yeah, especially when we found out he’s older than we are,” quipped Jane, with a wink. “I mean that’s an anomaly here in Hollywood, having an older man with a younger woman,” finished Helen, as the auditorium erupted into laughter. We. Love. These. Ladies. We like to call it ‘doing a Natalie Portman’ after Emma Stone’s dropped the line, “these four men AND GRETA GERWIG created their own masterpieces this year,” while presenting the award for Best Director. It’s a clever call by the actress with the statement not only acknowledging the Academy for including Lady Bird director Greta Gerwig in the category but also still pointing out the lack of female nominees. The Best Actress winner invited all female nominees, from all categories, to stand as she accepted her award. “I have two words to leave with you tonight, ladies and gentleman: inclusion rider,” said Frances, who won for her performance in Three Billboards Outside Ebbing, Missouri. In case you’re wondering, an inclusion rider is a clause an actor can put in their contracts if they want to ensure gender and racial equality on film sets. The Academy – and more specifically Best Picture presenters Faye Dunaway and Warren Beatty – took the “if you can’t beat them, join them” approach to addressing last year’s craziest Oscars moment. (You know, when they announced La La Land as the winner when it was actually Moonlight). “It’s so nice seeing you again,” Beatty began. “Presenting is lovelier the second time around,” joked Dunaway, as the audience gave them a standing ovation. The duo then successfully announced The Shape Of Water as this year’s Best Picture and 2017’s mistake was all but forgotten. Photos: Getty Images and GIPHY.